A common problem with creating portable PSTwo systems is that the screen turns green after 20 or 30 minutes. There is now a permanent fix. The short: Lift the lower end of each of the CV53, CV54, and CV55 SMD caps on the PSOne LCD board. Connect the R G and B inputs directly to the lower end of these caps, with CV53 to Red, CV54 to Green, and CV55 to Blue. This bypasses a bunch of extra circuitry, which presumably causes the green tint effect. Enjoy! 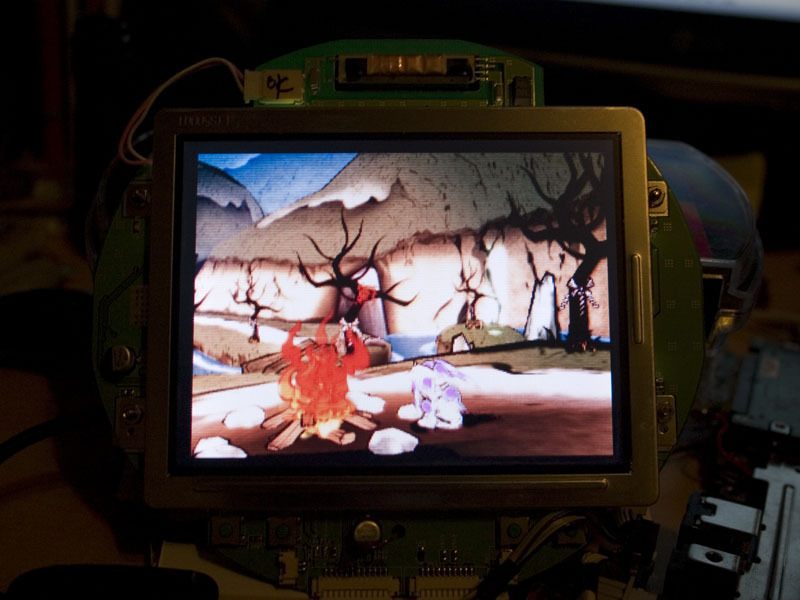 First off, a little background… I personally have seen the green tint issue, and on the exact same PSTwo and PSX screen used in this example, the effects were noticeable after 20-30 minutes of play. I've read segasonicfan's thread on the BenHeck forums, which had eastsider_1's fix for connecting the R and B lines to +5v, and segasonicfan's revised method of jumping R and B together, which did help me, but I found that a bit annoying and figured I could do better. 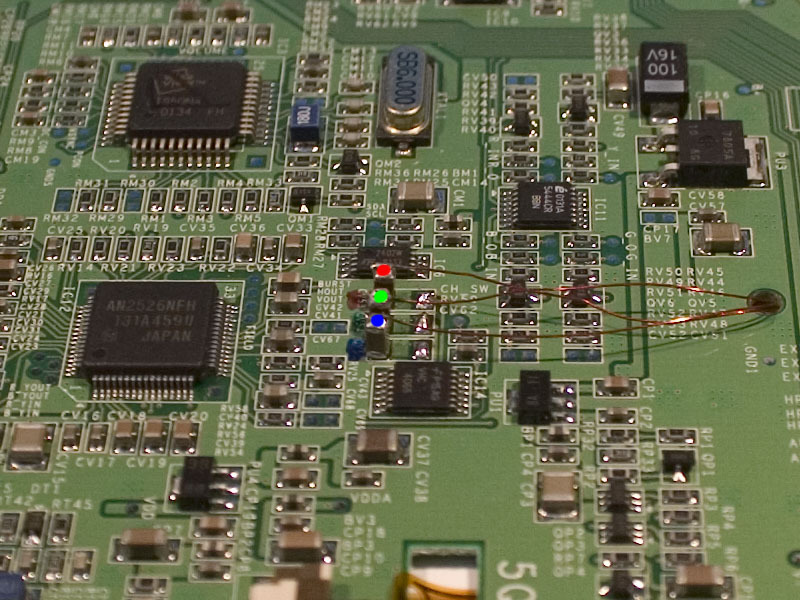 I started looking at the screen's PCB, checking datasheets for the main IC's and tracing signals. I was interested to find that the LCD signal processor (Panasonic AN2526NFH) required only a 1uf capacitor on each of the RGB lines, but that Sony had thrown in a bunch of other components - extra caps, IC's, signal switches, resistors, transistors, etc. I figured part of that was to be able to switch between RGB and te external composite input, but of course I didn't need that. I found 3 SMD capacitors, marked as CV53, CV54, and CV55. These are inline with the red, green, and blue lines, respectively, and are rated at 10uf. Basically, at this point I thought, “why not bypass all the extra crap?” so I did, and it works! I ran my PSTwo on this screen for over 2 hours without experiencing the problem. To fix this problem, all that's required is to find those 3 capacitors, lift one end up (the end that doesn't connect to the signal processor), and connect 3 wires from the input connector directly to those 3 caps! I didn't touch the sync signal at all, and I didn't disconnect the RGB signal from the original circuit, save for lifting the 3 caps. The only side effect I've noticed is that the picture is a bit brighter than usual, even when the brightness is lowered all the way. Also, this mod may affect the ability to use the external video input, but I didn't test it to find out. These are the 3 caps in question. Basically, I've removed them and resoldered them upright, so as to only connect on one end. I then soldered the 3 wires to the PCB input connector. Note that I've lifted the lower side of the cap up, so that it's standing only on the upper connection of the footprint. Here's the other end of those wires. I used 30ga insulated magnet wire for this, but you can use whatever you want. 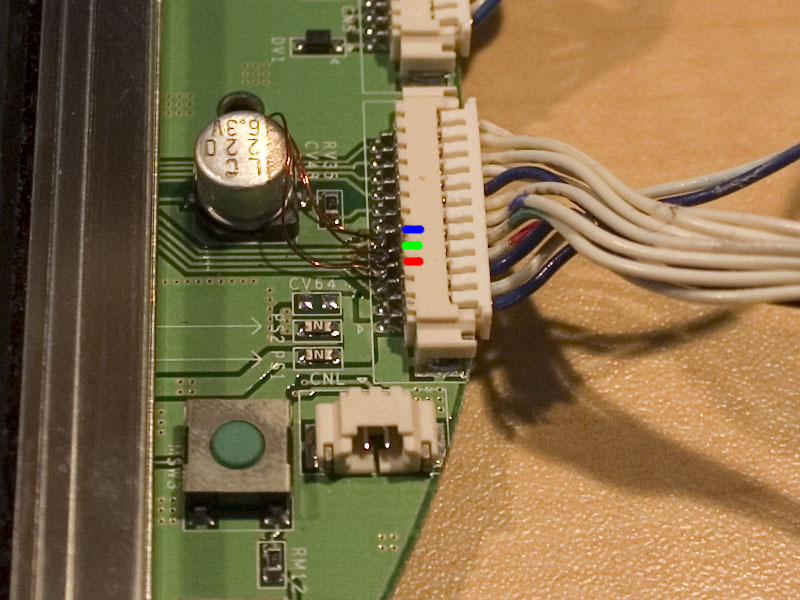 On the input connector, pins 4, 5, and 6 (counted from bottom up) correspond to red, green, and blue. Any question or comments, please post in my original thread here. Feel free to use this info anywhere, so long as credit is given to TertiumSquid/Simon Allan, and so long as the info is distributed freely.